With the Super Bowl fast approaching, there is plenty of preparation to be done before game day. You need to prepare snacks, choose a team to root for (if your favorite team didn’t make it this year), keep a cooler stocked with ice-cold drinks, etc. More important than all of these, however, might be having a proper venue for actually watching the game. At Boston Closet, we design custom entertainment centers built to suit your specific needs and style, creating the perfect place to house your big-screen TV. What better way to enjoy the Super Bowl than with your own custom entertainment center from Boston Closet? Our custom designs can accommodate any style and setup you can imagine. Buying an entertainment center at a store can come with all sorts of hassles. You have to take measurements to make sure your TV will fit, find space for any peripherals such as game consoles and stereo systems, and there’s no guarantee that the finished product will match the style of your home. The professional designers at Boston Closet, however, will work closely with you to design the perfect entertainment center for your home. We will come and assess the living room or den, wherever you intend to put the TV, and work with you to create the perfect entertainment center for your style and needs. Made to fit – you never have to worry about your TV fitting in your entertainment center, or about your entertainment center fitting in your home. Designed with your needs in mind, your custom storage system will have all the space you need to store all your movies, games, sound systems, and whatever else you choose. Enjoy plenty of shelves to display your favorite sports paraphernalia, such as jerseys, trophies and photos. Minimize distractions and tripping hazards by keeping cords neatly tucked away and hidden with your custom entertainment center’s unique design. Get exactly what you want, from a simple TV cabinet with a few drawers to a sprawling wall-to-wall unit. 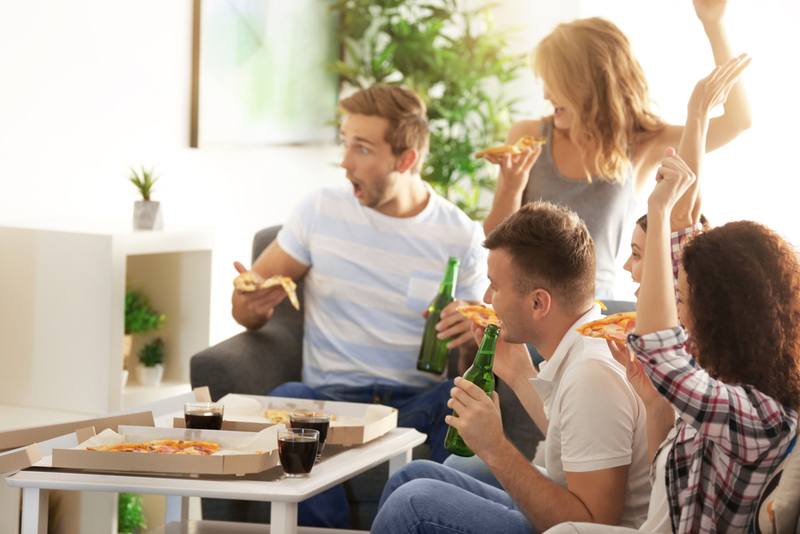 The Super Bowl is about more than just watching the game (although that’s certainly a big part of it); it’s about sharing an experience with friends and family. It’s a day to gather around and enjoy the exhilaration of the game, good food and drink, and the company of friends. At Boston Closet, we’re proud to be able to make this great day even better with just the simple addition of a beautiful, custom-made entertainment center. Let our professionals design the perfect storage system for you. Contact Boston Closet today and get a FREE consultation!